Peanut butter and apple are soul mates. 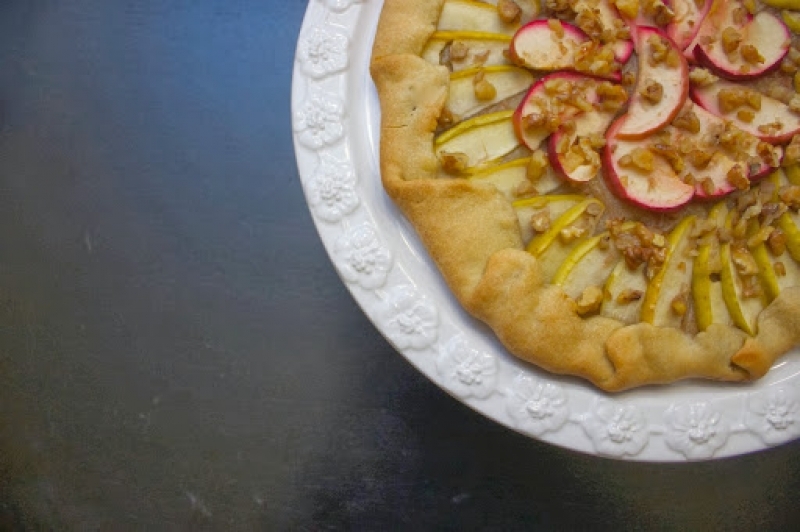 They come together in this easy and beautiful peanut butter and apple galette that has no refined sugar. Editor's note: The Ontario Apple Growers supplied me with the apples to write this post. However, all the research, the recipe and story that make this post are my own. Perhaps you remember my chocolate chip cookie-loving boss. Since September, his vice has been pumpkin spice muffins from Tim Hortons. Admittedly, he convinced me those sugar bombs stuffed with a glob of tooth-aching icing and pumpkin only in spirit were worth eating after he plunked one on my desk one day in an attempt to corrupt — er, convert — me. I'm going to blame my caving in on being pregnant. I still have 16 weeks to play that card as an excuse for eating food I normally never would, so I'm going to use it. Except when I'm eating an apple with peanut butter. My boss, on the other hand, was convinced when he caught me using a red delicious apple as a vessel to transfer peanut butter from the jar on my desk to my mouth that this was some sort of bizarre, belly-driven indulgence — like the stereotypical 'pregnant woman eats dill pickles and ice cream' scenario. Despite my protests, my pumpkin spice-savouring superior refused to fully unwrinkle his nose and believe me when I tried to tell him that even before I was pregnant, apples and peanut butter were one of my favourite snacks. Have been since I was a child and my mother introduced to me to this perfect pairing. Apple and peanut butter are like two good buds. Best friends who, when around each other, find that everything is easy, fun and harmonious. There are no pretenses, nothing is forced. It's comfortable. And if they were human, they'd giggle at those who thought they were an odd pair because they knew otherwise. So when a huge basket of golden delicious and spartan apples from the Ontario Apple Growers landed on my doorstep, eager to be turned into something more glorious than their already perfect incarnations, it was the newly emptied jar of peanut butter — its sides and bottom scraped clean of every last dreg of smooth, peanuty goodness — that inspired me. The thrill of possibly convincing my boss how wrong he was to be so dismissive of the apple and peanut butter combo didn't hurt either. The wheels started turning to convert him, much like he had done with me and that darn pumpkin spice muffin. I settled on a galette, also known as lazy man's pie, for its ease in assembly and its ability to make me look like a genius baker. My newly acquired, overflowing basket of apples aside, the great thing about this biblical fruit is that there are plenty of Niagara-grown options into which those hungry for local food at this time of year can sink their teeth. Though far from the largest apple-growing region in the province, Niagara does its part in helping Ontario produce 40 per cent of Canada's apple crop, with the most popular varieties being McIntosh, empire, northern spy and red delicious. According to the Ontario Ministry of Agriculture and Food, Ontario's 700 apple growers produce $85 million-worth of fruit every year. That puts into context how big a bite last year's April frost, which wiped out 80 per cent of Ontario's apple crop, took from our economy. Despite the snow flying at the moment, it's still easy to find Niagara apples. Torrie Warner has 16 varieties available right now, grown on his 30-acre farm in Beamsville. He sells direct at his farm or through the Niagara Local Food Co-op. When I lived in Fenwick, the Apple Bin on Highway 20 in Fonthill was a regular stop for me for cider and empires. Farmer Harold Damude isn't a big man but I always marvelled at his large, fleshy farmer's mitts and the gentle way they'd place his year's work and my future snacks into a plastic bag for me to safely transport home. Williams Orchards in Fonthill is also worth checking out, though call ahead because after Christmas, their hours aren't regular. Just when you might think Ontario apples are done for the year, the red prince, a cross between the golden delicious and red Jonathan, is starting to make an appearance on store shelves now. This new variety is harvested in the fall but cellared for a few months to get it tasting its best. And it happens to be great for baking, which means it would be good in a galette — a peanut butter, and apple galette that I'm proud to say made my boss realize the error of his ways, even if he was reluctant to admit it. Welcome to the peanut butter and apple fan club, boss. Your membership card is in the mail and you can leave the pumpkin spice muffins at the door. There's a lot of waiting with this recipe, so don't be daunted by the time it takes. The combination of apple and peanut butter make it entirely worth every minute invested. Thank you to my friend Laurie Sadowski for being my sounding board for this recipe. Pulse flour and honey in a food processor until blended. Then add butter and peanut butter and pulse until roughly mixed and crumbly. Add ice water and blend until dough is moist throughout. Remove dough from processor and form into small, thick disk. Wrap in plastic and refrigerate at least one hour. Between two pieces of parchment, roll out pastry dough to 12-inch diameter or 1/8-inch thickness. Place back in fridge for 15 minutes on baking sheet while you slice the apples. Assemble apple slices in a circular fan with one circle being one colour of apple and the next, the other. Or alternate one green slice and one red slice within the same circle. Leave about an inch of space between the apples and outer edge of the crust. Drizzle apples with honey and sprinkle with walnuts. Then fold dough toward the centre of galette, pleating as you work your way around the circle. Bake for 25-30 minutes, or until crust is golden brown. Open the can refrigerated coconut milk from the bottom. Remove coconut water and set aside for a smoothie or another use. In a bowl, combine remaining coconut cream, peanut butter and icing sugar. Beat with a hand mixer until ingredients are combined and fluffy. Serve with galette and store unused portions in fridge.